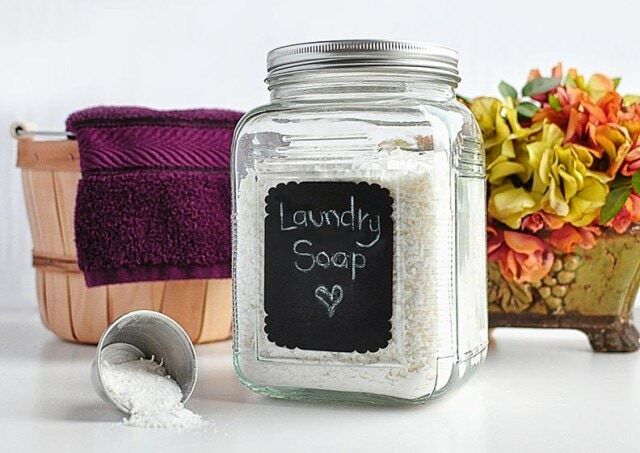 Making your own laundry soap is easier than you think, and it smells heavenly when scented with lavender or citrus essential oils. Our recipe will give you enough for 65 to 95 loads of great-smelling laundry. Place all ingredients in a large airtight container with an easy-open lid. Make sure to mix the ingredients well so that they are all evenly distributed. If you want to make the detergent a liquid form, use the same recipe but add the shaved castile soap to about 6 cups of water and boil until fully dissolved. Remove from stove and add in the rest of the ingredients and stir together until fully blended. Let sit for about 10 hours or more, allowing it to thicken. This is a concentrated form, so you only need 2 ounces per medium load. This makes low suds, which means it’s good for both regular and HE washers. Both recipes yield just over 85 ounces of detergent or between 65 and 95 loads, depending on how much is used per load.